No property owner ever gets into real estate wanting to go through the eviction process, but sometimes it is the best way to solve a problem and protect your investment property. Learn when evicting a tenant might be your best option and how to evict a tenant legally. You must have a legitimate reason for evicting a tenant, such as failure to pay rent or violation of the terms of the lease. If a tenant damages the property, ignores rules regarding smoking, subletting or pets, or creates a safety hazard, you have cause to evict. Legally, you must be able to prove the renter did something wrong. This is where a strong lease comes into play: It’s much easier to evict a tenant if you have a good lease that clearly outlines what tenants may or may not do, when rent is due, and what will happen if a tenant ignores the lease. Assuming you have a valid lease agreement, you can evict tenants once they break the lease or fail to pay rent on time. Decide if it’s worth initiating an eviction over something. A renter who usually pays on time and is considerate may not need to be evicted over one late payment, whereas a chronically late renter may need to go. Even if tenants owe you money, you cannot evict them without going through the proper legal channels. Nor can you harass tenants, change the locks, or move their possessions. If you undertake one of these actions out of spite, it could invalidate your eviction. An eviction notice informs tenants that you’ll be evicting them, thus kick-starting the legal process. Since you’ll need proof that you served the notice of eviction to the tenant, it’s advisable to tape a notice to the apartment door and send a second copy of the notice via certified mail. The eviction notice states the grounds for eviction (i.e., past-due rent) and any action the tenant can take to avoid eviction (such as paying back-due rent by a given date). Before you serve tenants with an eviction notice, check your state’s laws. States typically have a waiting period between serving tenants and filing a lawsuit. Once the waiting period passes, you can retain a landlord-tenant lawyer and file for eviction. If the renter fails to show up in court, you’ll be granted the eviction. A judge will set a date by which the tenant must move out; if the tenant is not gone by that date, you can hire the local sheriff to forcibly evict him or her. If the tenant disputes the claim, a lawsuit can drag on for several months before a judge makes a determination. While the formal eviction process is time consuming, it must be followed. 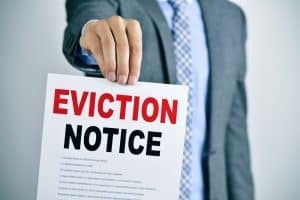 As a best practice, download an eviction notice that was reviewed by independent attorneys, and retain a lawyer if a tenant does not respond to your eviction notice. At American Apartment Owners Association, we provide free and low-cost forms for landlords that are reviewed for accuracy and legality by a team of landlord-tenant attorneys to help property owners comply with eviction laws. To get your landlord forms at the lowest price, become an American Apartment Owners Association member today.